I first made this pizza for a crowd while having a “Hurricane Party”. While Sandy was only a tropical storm at the point it hit us, we still found reason to gather together to eat and drink up what was in the kitchen. It was based on this situation that I created this delicious, sophisticated pizza. I cheated and used a pre-made dough, but if you’re looking to make your own, I recommend this homemade whole wheat pizza dough. Preheat the oven to 450 degrees. Brush the dough with a generous amount of olive oil, being sure to cover all the top of crust. Spread the mozzarella and 3/4 of the parmesan cheese over the crust and sprinkle lightly with salt and pepper. Bake the pizza until the crust is golden and the cheese is bubbling, around 8-12 minutes. Remove from the heat. 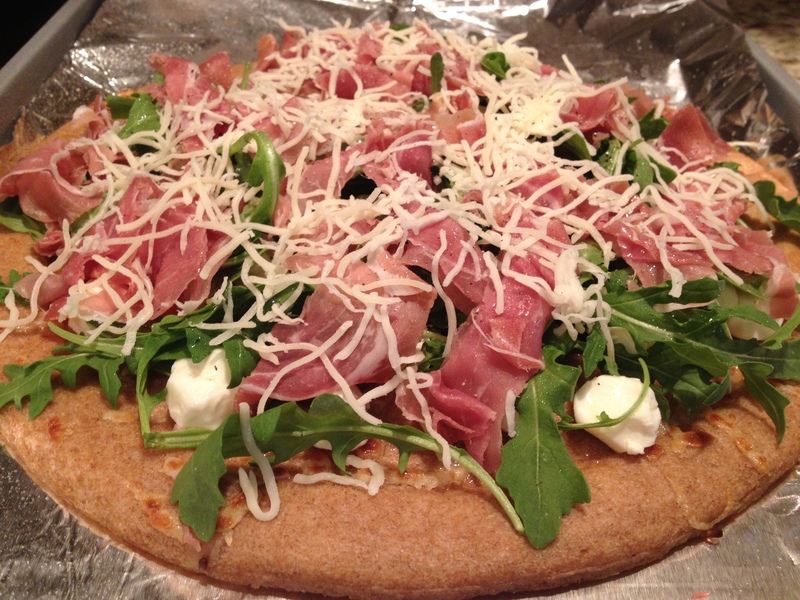 Lay the arugula on the pizza, along with the prosciutto slices and the remaining parmesan cheese. Very lightly, drizzle olive oil over the pizza in a quick “z” shape. Place back in the over for a couple minutes – just until the arugula starts to wilt and the prosciutto gets a little crispy. If you prefer, you could serve it without putting it back in the over. Want to jazz it up even another notch? Add dried figs on top, or fig jam under the mozzarella! Serve hot! Thank you! 🙂 It could work great as a meal, or an appetizer in smaller slices!